Overview of Engineering Mechanics. Welcome to the first session of engineer mechanics statics. This is the first course of engineer mechanics which normally consists of three courses: statics, dynamics and mechanics of materials or deformable solids. To take this course you should have successfully completed calculus one and one semester of university physics. Let me begin by asking you a question. In your opinion, what is mechanics. Please give the answer in your own words. Now here is my version of the answer and I try to keep it as simple as possible. First of all, as you already learned in physics, mechanics is a branch of physics therefore it is also a branch of science. But the title of our class has engineering in it so we have a special focus — we want to study not only the science itself but also how to apply it. And this is the essence of engineering — to apply math and science to solve practical problems. And mechanics is a subject that calculates, describes and predicts the different effects of forces on a system. This word system here is a very important concept in physics and I will revisit this concept many times in the future. It could include a single object, multiple objects or even just a part of an object. it could be as big as the earth, the sun or the entire solar system or it could be as small as molecules and atoms. So mechanics studies how a system is affected by forces here comes the next question: can you think of some examples of what force can do. 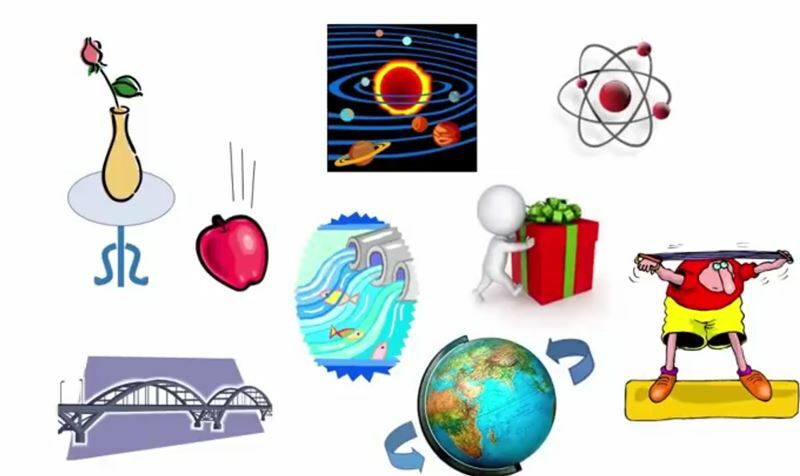 On this slide I will show some clip arts illustrating some typical examples of the effects of the forces. Forces can keep an object static. In this example the vase is stable because its weight is supported by the force from the table. Same as this bridge which is a more complicated system. Forces are needed to not only support the structure of the bridge,but also external loadings such as trains, cars, or people traveling on the bridge or even the wind blowing on the bridge. Force can make things move. In this case we can push an object to move translationally, in other words, along a line, or are we can rotate an object. We are all familiar with the gravitational force. In this example the apple is falling because of its own weight which is the gravitational force exerted by the earth. Forces exist at astronomical level, at atomic level or even subatomic level governing the motion of the planets or pulling the electrons to orbit around to the nucleus. We also know that force can deform an object causing elastic deformation which is recoverable or plastic deformation which is permanent, or even causing the failure of the material. Forces can also affect the behaviors of fluids. As you can see the subject is very broad. So on the next slide let’s look at the different branches of mechanics and also what we will focus on. Here I’m going to show you a general chart of the different sub-disciplines under mechanics. Please note that this is not a comprehensive chart and does not include all possible sub-disciplines. In general mechanics can be divided into classical mechanics and quantum mechanics. classical mechanics studies systems that at macroscopic level, things of the usual size and speed that we are familiar with in everyday life. Quantum mechanics on the other hand focuses on atomic or subatomic particles and systems. For classical mechanics, depending on the different systems of study, it can be divided into mechanics for rigid bodies when the solids are considered undeformable, imagine a big diamond, deformable solids which are closer to real life materials such as wood or steel with limited strength or fluids which can be further divided into incompressible, water can be considered incompressible, or compressible fluids such as air. Depending on the status of motion rigid body mechanics can be divided into statics,when the system is in equilibrium,and dynamics, when the system has accelerated motion. Dynamics can then be divided into kinematics which deals with the geometrical aspects of motion, and kinetics which looks into the driving force of motion. Classical mechanics especially statics and dynamics are also known as Newtonian mechanics since they were developed based on the theoretical foundation laid by Sir Issac Newton. You have learned in physics Newton’s law gravitation as well as Newton’s three laws of motion. Next I will briefly revisit Newton’s second law due to its incomparable significance in our course. Newton’s second law states that unbalanced resultant force acting on the system causes the system to undergo accelerated motion. The formula is a very simple: F equals to m a, with m, a scalar, being the mass and a, a vector being the acceleration. I actually prefer to rewrite this equation this way to show that acceleration is the result of the force. The vector acceleration also has the same direction as the resultant force,and the mass m on the denominator position functions as a resistance to change in motion. And when there is no unbalanced force in other words when f equals to zero, Newton’s second law becomes Newton’s first law,where a is zero and the system has no accelerated motion. We say that the system is in a state of equilibrium. The system will remain at rest if it is initially not moving but if it’s initially already in motion it will continue moving with unchanged speed or direction. In our course when we study equilibrium most likely the system is not moving at all. So with the refreshed memory on Newton’s first and second law now let’s look at the respective scopes of the three courses in engineering mechanics. We study solid systems only. We can have rigid bodies which do not form,and particles can be considered as a kind of special highly simplified rigid body with essentially no size or shape, only mass. Or we can have deform-able solids which are closer to real materials that can deform and have limited strengths. And we study two types of status of motion:equilibrium governed by Newton’s first law,or accelerated motion governed by Newton’s second law. As you can see the first two with lighter backgrounds are relatively simple and the bottom two with darker backgrounds are relatively hard. Statics studies rigid body equilibrium. It is the easiest class of the three and that’s why we learn it the first. But at the same time it is also the most important since it builds the theoretical foundation for the other two courses. Both of the other two courses continue on from statics. Dynamics studies rigid body with accelerated motion. It could be a translational or rotational,or a combination of both. In dynamics we not only learn to understand and predict the motions of rigid bodies, but also study other topics related to motion such as work and energy, impulse and momentum. And mechanics of materials studies deform-able solids in equilibrium. It deals with many how materials behave when sustaining Loading’s. We want to know how forces cause stress, deformation and even failure in the system. It is important in many fields such as constructional design because we want to build safe and strong structures without being wasteful.